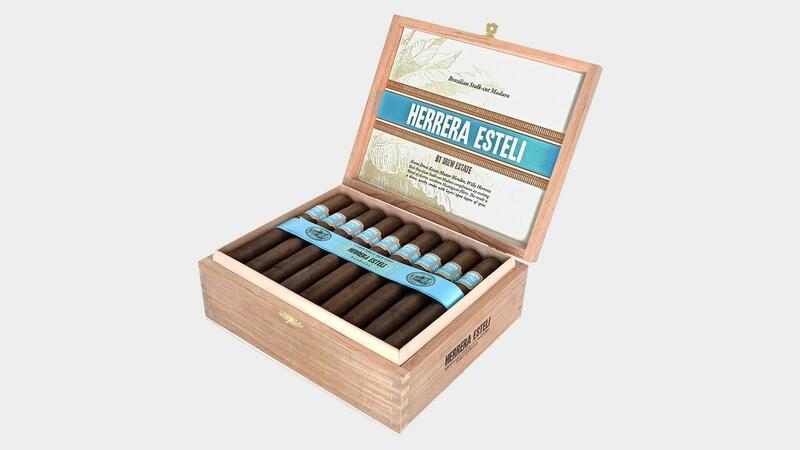 The new Herrera Esteli Brazilian Maduro, which debuted earlier this year at the IPCPR trade show, features a dark, Brazilian Mata Fina wrapper over a Connecticut broadleaf binder with Nicaraguan filler tobaccos. Today, it has begun shipping to cigar shops everywhere. The newest addition to the lauded Herrera Esteli brand, Herrera Esteli Brazilian Maduro comes in five sizes: Short Corona Gorda, which measures 5 7/8 inches 46 ring gauge ($8.16); Robusto Grande, 5 1/4 by 52 ($9.12); Maduro Lonsdale, 6 by 44 ($9.28); Toro Especial, 6 by 52 ($9.68); and a figurado called Fino, 6 by 52 ($10.80). Each size will come in flip-top boxes of 25. “With the Herrera Esteli Brazilian Maduro, I wanted to bring the Mata Fina to the forefront of this blend. This tobacco has such a unique texture and it showcases the lush floral and earthy notes I wanted to capture in this cigar,” said Willy Herrera, Drew Estate’s master blender since 2014. The newly redesigned packaging for Herrera Esteli Habano (left) and Norteno (right). In addition to the new Brazilian Maduro, Drew Estate is also shipping the new-look Herrera Esteli Habano and Norteno, which have undergone a packaging change. Both brands now come in 25-count flip-top boxes, similar to the Brazilian Maduro blend. The Norteño Robusto Grande was named Cigar Aficionado’s No. 7 cigar of 2016.